Electronic Arts announced in a press release on November 8, 2007 that they would donate a copy of the game SimCity to the One Laptop Per Child (OLPC) initiative. SimCity, a game that was first released in 1989, allows its player takes on the role of mayor of a new municipality—responsible for building and maintaining a place where citizens can work and live happily. Doing so requires laying out essentials such as housing, employment areas, transport links, schools, and commercial uses. The job also requires an ability to choose wisely—for example, some power sources pollute, while others do not but are more expensive. Players must also be financially savvy—raising taxes enough to guarantee an income that can be allocated to public services such as policing and road repair, but not so high that business growth is hampered or that citizens revolt. The mayor must always be prepared for emergency situations as well, as earthquakes, floods and fires can wreak havoc on the town and require an immediate response so that fallout can be contained. The OLPC is a not-for-profit humanitarian effort to design, manufacture and distribute inexpensive laptops with the goal of giving every child in the world access to modern education. OLPC will begin distributing laptops in countries such as Uruguay, Peru, Mexico, Ethiopia, Rwanda, Haiti, Cambodia and India by the end of 2007. By gifting SimCity onto each OLPC laptop, EA is providing users with an entertaining way to engage with computers as well as help develop decision-making skills while honing creativity. I think the OLPC is a great initiative, as long as basic living conditions are already available for people that they are targetting. For example, it makes no sense to give out these laptops, if things like shelter, food or water are not available. This falls along the lines of what Bill Gates talked about during his last MVP Summit keynote that I attended (details here). Once those basic living conditions are met, then the OLPC becomes a really compelling initiative with great potential. Since SimCity was one of the things that eventually pushed me toward my current career as an urban planner, coupled with my on-going interest in computer technology, I think this was a great move by EA to partner with the OLPC. Hopefully the inclusion of a game like this will help children learn about the complexities of city building, the role of government and the effect of land use planning decisions that have social, economic and environmental implications. Who knows, maybe some of these children will end up making a career out of this like I did! For more information, see the EA press release "EA Donates Original City- Building Game, SIMCITY, To "One Laptop Per Child" Initiative". 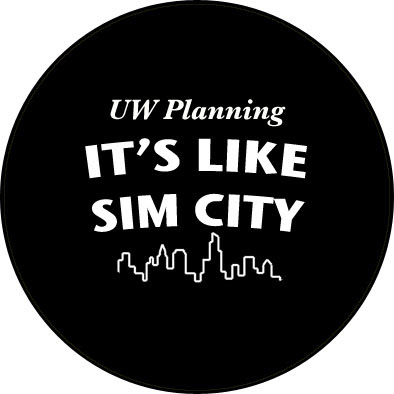 Correction: ALL planners of our generation grew up on SimCity. Proof: I have owned all four incarnations of the game, plus SimTower, plus SimFarm.